I’ve been thinking a lot lately about what I really want to do with my life. I’ve known for a long time that my heart’s desire is to work with children, especially young children, and I’m doing that right now. I work 41 hours a week in a daycare as the sole responsible adult for 5 babies, ranging from 11 months to 15 months of age, plus an assortment of slightly older children in the late afternoon. It is the most exhausting and possibly the most rewarding thing I have ever done so far. Seeing the babies grow and develop, helping them to meet milestones and watching them learn to do so many things for the very first time is just amazing. There ARE times when my days can be utterly frusterating and draining, like when a child is crying and despite my best efforts, I cannot seem to comfort them or when they keep purposefully hurting other children for seemingly no reason, heedless to my attempts at demonstrating using “gentle hands” (aka don’t pinch, hit, pull hair, yank smaller children to the ground, etc.) and explaining that “OW! Biting hurts!” . I have literally left work so completely emotionally depleted that I ended up sobbing in the car, feeling like I can’t possibly face another day of 3 hours straight listening to a child shriek and wail endlessly as I try to sooth them and simultaneously provide care and love for 5-7 other infants. But there are many other times when I can’t help but wonder over the absolute miracle that each little one brings to this world. I love each of them and I try to pour as much of that love into them as I can, even– well, actually– especially when it is hardest to do so. The beautiful sound of their laughter, the effort they put into learning how to walk, their delight in tiny, simple things, the joy of watching them learn to communicate with their first words and seeing them begin to build the emotional foundation stones that will lead towards towards empathy, compassion, and love as they mature… There are no words to describe how incredible it is to be a part of that. It is also a huge and very sobering responsibility. The fact is, that we (the daycare teachers) are with these children more than their own parents are. Five days a week, they are in daycare for an average of 10 hours. When you figure that most of them sleep for 10 hours a night, that leaves only 4 hours a day with mom and dad, plus possibly weekends! These parents are entrusting their child’s most influential years into our hands. 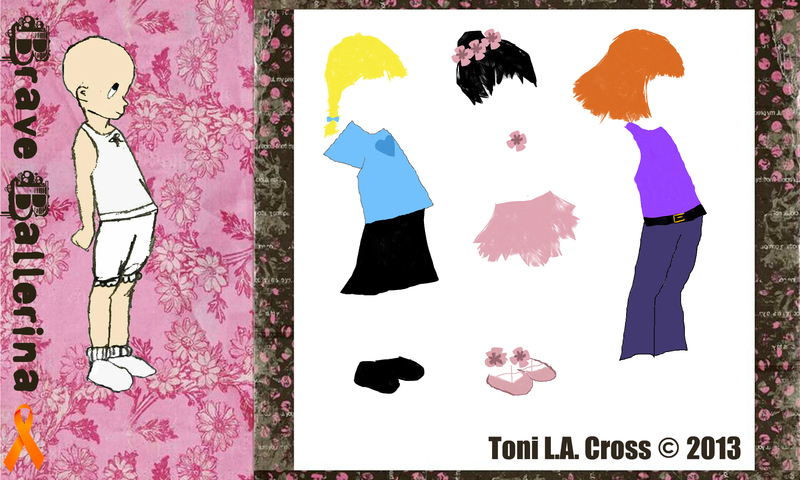 Even though the babies will not remember us, we are molding how they will react to life, on the most basic of instinctual levels and also how prepared they will be for the next stages of development and learning. That said, looking at the future, I’m not sure if this is my chosen career path forever. I am faced with the decision of whether or not to get my CDA (Childhood Development Assosiate Credential), which would have many benefits for me in this field, but would also be ANOTHER thing that I will need to accomplish, on top of the weekly “Conscious Discipline” classes (positive reinforcement childcare theory) and online Teaching Strategies courses (state childhood development standards) that I’m supposed to be starting, my normal workload, and everyday life with my still fairly “new” husband of about 7 months. I also still greatly desire to be a mother (hopefully soon!) and if daycare work has taught me anything, it is that I really don’t want my children to be in daycare. (Ironic, right?) Don’t get me wrong, the daycare center I work at is really quite fabulous and my coworkers are lovely people who pour their all into these kids… But I don’t want someone else to be the most influential person in my baby’s life. I don’t want to miss the wonder of seeing all the little things or miss out on seeing them develop into the person they will become. I guess that is part of what I have realized lately. Time is so, so precious, especially when it comes to children, because a year is nothing really. It flies by so quickly! 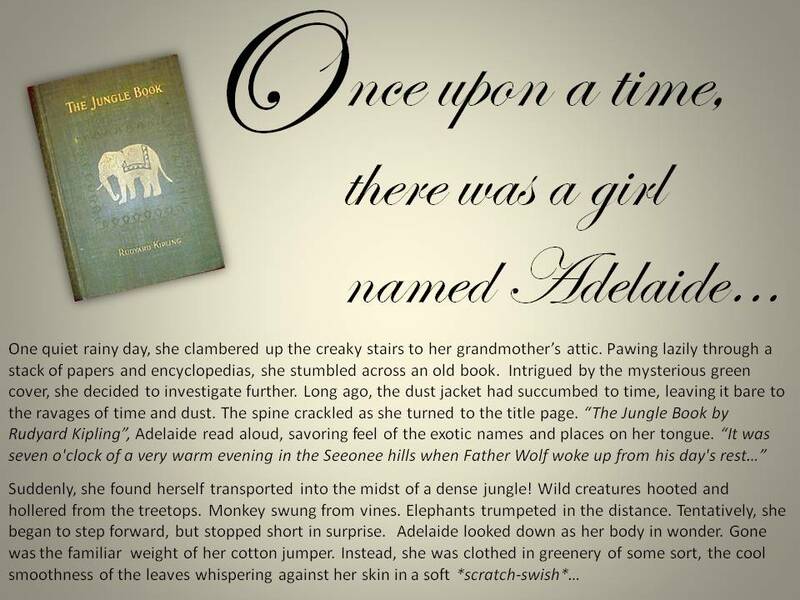 Adelaide, Brave Ballerina… A MicroStory! 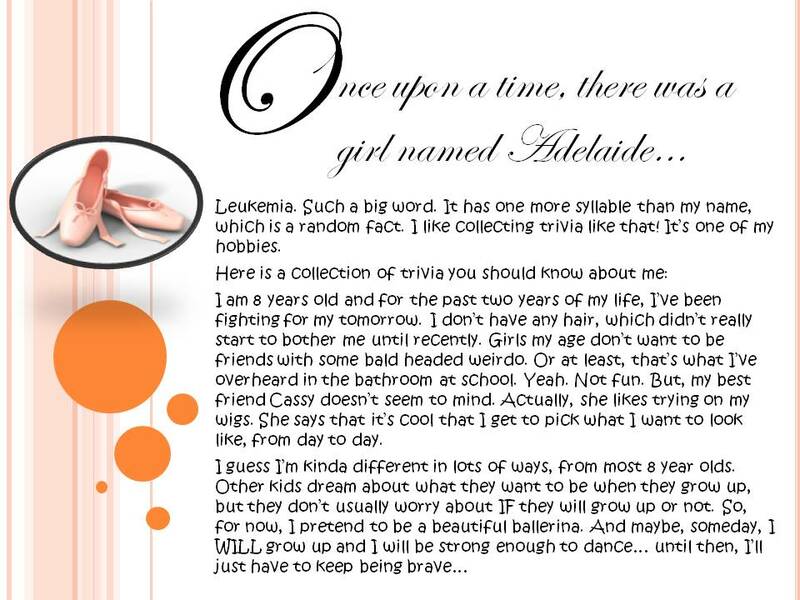 So, without further adieu, here is the MicroStory for Adelaide, Brave Ballerina! 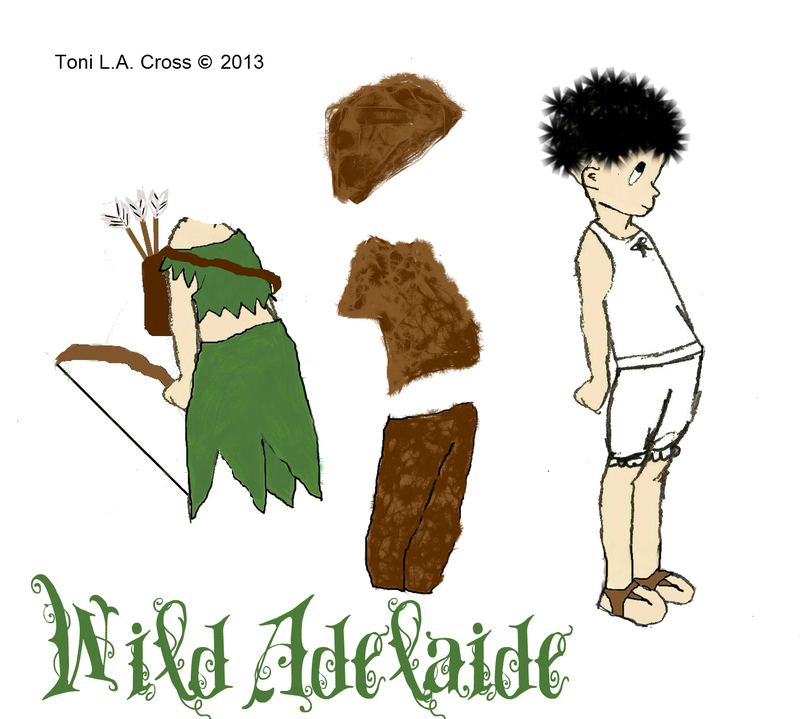 So, without further adieu, here is the MicroStory for Wild Adelaide!